Titles are important – as much for what they don’t reveal as what they do. The title of Hetain Patel’s latest show, At Home, at the New Art Exchange, Nottingham conjures up many associations. Invitations to call on genteel ladies, visiting cards left on a silver tray, elegant soirées held in heavily-curtained drawing rooms, a time of outer restraint and strict adherence to the graceful protocol of etiquette. Born in Bolton, to Indian parents who came to Britain in the late 1960s, such is clearly not the landscape of Patel’s own particular domestic experience. And yet, his aesthetic, rather like that of the city of Nottingham, harbours subtle, whispered, references to this, now unfathomable and completely alien, western, yester-world. Such is the complexity of this work and this artist. For all this, Patel’s title is to be taken at face value. He is literally, at home. At home with his family. At home with his wife. At home in Nottingham. At home with his work. At home with himself. 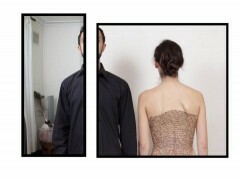 At Home comprises two films, a video installation and a series of photographs. Three of the pieces were completed in 2012, with one having been made in 2009. After making To Dance like Your Dad (2009) Patel talks about ‘how something changed‘. It was a pivotal moment. The film consists of two separate videos, played simultaneously. In one Patel’s father, with a distinct Lancashire brogue, talks to camera, explaining, as he walks, his work in a coach building factory. In the other, Patel, in what looks like a dance studio, imitates the movements, words, accent, mannerisms and discomfiture of his parent. This kind of aping is a distinct feature of his work. And doing it as well as Patel does requires a keen attention. Hoary questions of identity hover, but it is the warm exploration of a child parent relationship that wins out. Once again the associations are rich ones. The sliding of tiny feet into what seemed like gigantic shoes. Wanting to feel what it was like to be them. Inhabiting, imbibing the power, the adultness, the strangeness of them. And yet the familiarity too. The family-ness of them. This strange copycat dance becomes a kind of conversation between the two men: a conversation of physicality, of blood, of connection. In Eva (2012) both Patel and his wife are photographed perching on a stool, Spiderman style. On her back he has drawn a series of comic book covers. This is the stuff of his childhood that he has tattooed onto her skin. A gesture of sharing and yet, also one of owning, of possessing, of branding. A beautiful set of photographs but with discomforting undertones, which need not be explored. Not now. Not today. Thematically, they pay homage to a rich tradition of Western artists’ self-portraits with their wives; perhaps the most iconic being Rembrandt van Rijn and Saskia van Ulyenburgh, Stanley Spenser and Patricia Preece and Pierre Bonnard and Marthe Boursin. Like Rembrandt, Patel is sharing the joy and pride he feels about his life with his wife. This is their domesticity, their home and their fridge. In one a hennaed love-letter patterns her lumbar region, in another they carry out an etched conversation, again comic-style, through speech bubbles on naked flesh. Conversation is the thread that holds this show together. A conversation with his family, his wife, with us, with himself. The earlier angst of trying to locate a firm, certain identity (a word that still peppers Patel’s website and the gallery blurb that accompanies the show) has been replaced by a new found, blithe-ful acquiescence towards the disparate parts of his west east nature. As for many ex-pats, like his parents, the homeland takes on mythic quality that seeds itself, often unbidden, into blood of their offspring. Patel plays with this. It has become light. Easy. He dresses up. Eva dresses up. Both borrowing something. Play-acting. In First Dance (2012) we see her before a mirror, readying herself to go out. She wears a sari; we hear the jingle-jangle of her jewellery. Another image shows the street outside. A car moves leaving an empty space, dry of rain. Patel is be-suited. He stands in the road holding a long ruler. He begins to move. Images of a sword dance from Crouching Tiger, Hidden Dragon appear, explaining his imitating, his copying. Eva waits and watches. The romance of the film melding into the fantasy of heritage. The presence of Patel’s grandmother, lends flesh to the fantasy. In Mamai (2012) she sits saying her prayers, wringing a piece of cloth, round and through her hands, rocking and rocking. Five TV screens rest on the gallery floor. In each one we see her. She is lead in, back hunched, a shuffling figure, slightly at odds on the stiff Victorian-esque sofa. Each screen offers a slightly different moment. She is wearing another cardigan, the door is open and then it is ajar, someone walks through the hallway. Such gentle jarrings encourage a concentration. Patel is playing again. Playing with time. It suggests a continuum; it challenges the notion of linear space, of straightforwardness. Ellen Bell is an artist and writer, currently living in Mid Wales.